It’s time to take a look at the third Equestria Girls film. While the first 2 tried to be taken very seriously as slice of life films with a little danger and tension thrown in this one opts for a more low key experience. Instead of a very dark and mysterious intro song during the credits we get a very happy piece. Instead of seeing a thief break into Equestria and stealing a relic during the opening scene we have…Rainbow Dash pulling a prank on the main characters. Sunset even breaks the third wall to let us know that there won’t be any big end of the world stuff this time. It’s a bold move on the writers part but not necessarily a bad one. Not every film has to be a life and death scenario. Sometimes it’s fun just to see the heroes hanging out…but if that’s the case then why did I feel sad for a split second? Well, the plot of the film is that the Friendship Games are coming up. Rainbow Dash wants the team to be prepared to give it their 100% during this competition because anything less than a gold trophy will be disappointing for her. I can understand the sentiment but she has to realize that the rest of her teammates aren’t quite on her level. Still, she is confident that they can win, especially since the Mane 6 can Pony up when they start singing. 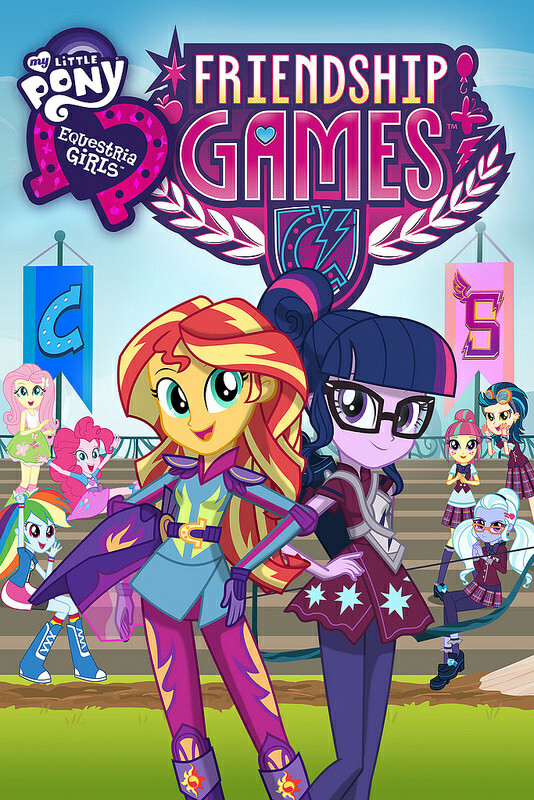 Sunset thinks that the games sound like a lot of fun, but none of the characters invite her to sing with them so she doesn’t say anything. Still, she senses that something is wrong. Someone is draining the last remnants of magic from this world and that’s not a good thing. Meanwhile we then cut away to the second part of the plot. Most good films let you see both sides of the situation and this one is no exception. Just as we had the heroes earlier now as get to see the drainer. False Twilight Sparkle has appeared in the world and she is trying to find out why there is magic in her seemingly normal world. She starts to drain the Mane 6 of their abilities while also helping her school win the Friendship games. Twilight isn’t a bad person, she’s just been making a lot of bad decisions. As for the Friendship Games part, she is being blackmailed into entering by her principal. Losing isn’t an option so if she has to crush the Mane 6 in order to succeed…so be it! I knew we would eventually get to see Twilight Sparkle of this world so it was nice to finally have her make a debut appearance. She definitely seems like a very reasonable character and I think it’s fair to say that she is a good character. She takes things in stride for the most part and it’s nice to see her hold her own against the Mane 6. It also opened the door for a school against school rivalry. While none of the students like Twilight, they do go to her defense when the Mane 6 arrive. While the film sets up some parallels between the characters for a nice rivalry it unfortunately doesn’t go anywhere. It was still a cool scene though and I appreciate the film trying to give the other characters some personality there. Twilight ultimately comes close to forsaking everything for power and shows that she may not have the strongest will power of the group. No matter though, she is still the strongest and even Sunset was losing in their skirmish. Yes, this film actually had a cool climax with a real fight in it. After the last two films I was a little worried about how this one would be handled, but it turns out that my worries were unfounded. I am very happy to report that you can expect some lasers to be thrown. I’m also fine with Twilight having the edge since no matter what universe it is you would expect her to have the strongest abilities. It’s why I would like her to go all out in the main show a little more since we can plainly see just how much potential she has at her disposal. While the animation and soundtrack aren’t quite as dynamic as in the first two films I would say that it still holds up well. As I mentioned earlier this film isn’t trying to be cinematic and opts to act like it’s just another episode. That’s not a bad thing though as the classic episodes are pretty solid so if anything the movie is trying to puts its fans at ease right away. We get some nice songs during the movie as well which were nice. If the film had been longer we could have seen more events before the final one. I like to think that the Cutie Mark Crusaders may have ended up stealing the show. They’d probably ace these events. The short length helps the film keep its tight pacing, but I think adding in another 20 minutes would have helped the movie flesh out its various subplots. Of course, you can’t have an MLP film without the Mane 6 getting into more disagreements. This part of the film feels a little forced as the friends should be over this kind of thing by now. They’re all getting on each other’s nerves for minor things like Rarity making costumes for everyone, Pinkie Pie not liking how the group is taking things seriously, Fluttershy’s music being annoyed (Slightly more major) etc. This paves the way for Sunset to show up and remind the heroes that she is their true leader. It was nice to see Sunset step up and everything, but I do think that the main characters shouldn’t fall to pieces so quickly. It just goes to show that they need Twilight or Sunset around for guidance. As always I would say that Rainbow Dash was the best of the main characters though. She’s here to win and doesn’t believe in holding back. The others could learn a thing or two from her. Still, none of the characters are bad, they’ve all got their moments. Overall, The Friendship Games were fun. I’m always up for a competition and since the film also added in a little extra danger in the climax I was certainly hyped for that. I do think that the plot for this film can feel a little similar to the last one since they’re both competitions in a way, but singing is a lot different than running a relay race so I’ll let that slide. If you haven’t seen this film yet then I would recommend doing so. It’s a fun movie that has the right balance of slice of life with a little action by the end. What else could you ask for? We’ll see how the next film fares as the heroes head to the forest. After all these years it is time to finally review my first Equestria Girls special. Ironically it’s the final one (so far) but the special gives a quick recap at the beginning which makes it easy to get most of the context here. It’s a fun special although it does go out of its way to make Twilight Sparkle look bad which is a little odd. I can see why this side of the series has a lot of fans as well since it’s a pretty fun cast, but the Pony world will likely keep its spot at the top. The end of the school year is rapidly approaching so Sunset Shimmer is preparing all of the pictures. 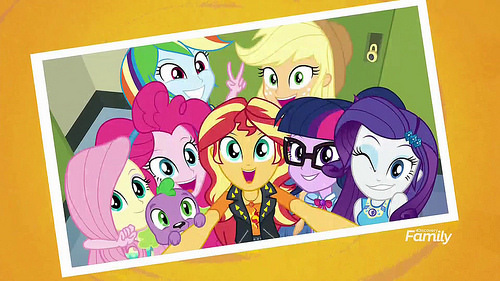 To help with this, Twilight has made a selfie machine and they are all going to meet at the Beach to use it. Unfortunately, when Sunset arrives there the next day, the Mane Clique doesn’t remember her and they actually go out of their way to make her feel bad. Sunset decides to go to Equestria to get to the bottom of this memory mishap, but the true source of trouble may be closer to home then she suspects. Could it be the new student??? I definitely enjoyed the fun intro. See, if you’re going to do a recap then there are 2 key things you need to do. 1. The recap has to be quick. If it’s too long then it defeats the purpose. 2. A song helps. Now, you can play it lazy straight and simply reuse the scenes but spreading them all out and adding a lyrical song to the mix makes it feel a lot more fresh. It has been a while since the last specials as well so a recap isn’t a bad thing. Since the special is under an hour, the plot starts very quickly. The pacing is always pretty good. The special is a little obvious with the culprit though. Let’s face it, the instant this new transfer student showed up you knew she was trouble. Technically Wallflower has been at the school the entire time, but she’s never appeared before so that’s definitely suspicious. Many other titles have done this before including even the recent Dark Dimensions. The important thing is just making the character likable even if you know she is evil. Wallflower isn’t a bad antagonist if you look at her purely as a villain, but if you try to sympathize with her goals than it may not work so well. She really dug her own grave on this one. I actually disagreed with the moral in this film. Not the actual message but I don’t think it applies here. As her name suggests, Wallflower hid in the background the whole time and nobody ever noticed her. Apparently this includes Sunset Shimmer and the gang so at the end they learn that they should have been nice to everybody. Not being mean isn’t good enough, you have to be actively nice. Thing is, we never have any scenes where Sunset isn’t being nice. There’s no real indication that this moral should apply to her. The only ground you have to stand on here is that Sunset and the others are being rude for not remembering her. If you’re in the same class as someone for years then you should probably know their name. However, we find out at the end that Wallflower was actively erasing everyone’s memories of her so why should she hold them accountable? I’m sure the main characters did know about Wallflower and probably were nice to her, but then they had their memories wiped. This means that now Wallflower’s argument has no weight and neither does the moral. All that being said, there is nothing wrong with being even nicer so it’s still not a bad ending. The music is certainly handled really well. The opening song was a lot of fun and the villain’s song was also very good. It was nice and fast paced while also being pretty emotional. The franchise has always been known for its songs but seems to really bring out the big guns for the films. It certainly helps the movie be even better. The film’s animation is also pretty solid. It doesn’t really seem to be any better than the normal shorts, but I suppose this special is more about getting the cast back for another adventure than it is about stunning everyone with the animation. I’d say it works well enough although I’m also used to it at this point. As I mentioned earlier, surprisingly the Equestria plot isn’t all that great as Twilight looks absolutely terrible. Now this may just be a running gag in the films as she didn’t look very good in the main one either but her role is completely out of character here. She is overly expressive and out of control here. Sparkle is actually afraid of Celestia and doesn’t do a good job of defending Sunset. I understand Twilight being nervous in season 1, but she’s already seen many times that Celestia always forgives her underlings. Celestia is still rather rude and unlikable as always here, but not to such an extent. Then we get to the library and that’s where Twilight’s panicking gets even worse. I’m guessing this is all just to make Sunset look even better in comparison but there’s no reason to make her look this bad right? If I didn’t know any better I would have assumed that she was the comic relief character of the series. Sunset looks really good though and has a bit more of an edge than the other ponies. She isn’t afraid to make threats of violence towards the villain and just comes across as tougher than the others. She has a leather jacket on after all and a previous rep as a villain so everyone still respects her. Sunset can still get emotional when her friends are involved, but at least she’s not nearly as mean about it as the others. She’s a solid main character and I certainly wouldn’t mind if she became the lead in the other show although her pony design doesn’t work as well as the human one. She basically has to save the day on her own although one other person was helpful. Trixie was never a great character as a pony, but in this world she seems to be one of the better characters. Unlike the other characters who were content to mock Sunset she actually did try to help. Trixie also stood up to her when Sunset was making threats and has some legitimite magic power. She also serves as the self aware character of the film as she fast forwarded through the villain’s song and mocked its length. The film was surprisingly poking fun at itself in several other moments like where the characters cut human Twilight off before she can talk about friendship. It’s handled pretty well if you ask me. Trixie is definitely the 2nd best character in the film and maybe this will translate well into future appearances in the main series as well. Unfortunately the Main 6 look really bad here. Their human forms just aren’t good. They may not remember Sunset, but it doesn’t excuse them being so mean and confrontational to her. They are completely judging her from their past memories even though she obviously didn’t come here looking for a fight. Maybe she has some kind of sinister plan, but I thought these heroes were all about looking on the positive side? They insult Sunset and deliberately try to hurt her feelings. If you didn’t know any better, you’d think they were the bullies of the series or the kind of “friends” you’d see in Ultimate Spider-Man where they make fun of the lead with and without their memories. You have to agree with Sunset when she admits that her friends losing their memories isn’t terrible since she still has Trixie. Trixie is certainly less stuck up than the others and seems like a true friend. Of course, the characters are so mean to continue the plot so I guess I won’t hold it against them in other specials, but it’s not a great first appearance for those girls. The setting for the special also isn’t my favorite since its the cliche beach episode. I guess even My Little Pony can’t avoid that trope although naturally it handles the episode in a classy fashion unlike 99% of other titles. It’s just there for the scenery as opposed to anything else, but give me the city backdrop any day. The writing for the special is pretty strong for the most part. The obvious exceptions are any scene with Twilight Sparkle and to an extent, any scene with the human ponies unless they are intentionally meant to look really mean. Towards the end of the film we get to see them transform and unleash their energy blasts though which is pretty cool. I’m glad they still have some level of abilities left within them here since that opens the door to a serious Tirek arc in this world. Trying to obliterate Wallflower may have been a bit much, but I suppose they really didn’t want to lose their memories anymore. Then we have made it to the ending. I have to say that the human versions of the ponies may actually be stronger than their normal counterparts with the exception of Twilight and Rainbow Dash as they can possibly use their energy blasts at will. It’s why we need a fighting crossover. As far as how I’d rank the human characters, Rainbow Dash is still the best with Applejack being a close second so that’s basically the same as always. The others are basically tied as they just weren’t any good, but I’ll give a proper ranking for all of them once I watch the first movie. This special was also a nice break from Equestria as it’s good to get some new backdrops. In general the human world will typically always beat a fantasy one although both have their perks. It’s just that the city leads to a lot of good environmental effects depending on what’s happening at the moment. The Beach is an exception but a lot of the special took pace within the school anyway. Overall, Forgotten Friendship is a fun special. I think it would have been better if they had just cut out the Pony subplot entirely, but it’s not as if it was bad. It was just really unexpected. This special is still a quality adventure and shows that the Pony universe is still going strong. I’m still in the middle of season 2 of the main show so it’ll be a while before I’m truly caught up, but at least this means I still have many more Pony adventures in store. I’ll probably still wait a while before catching up on the older Equestria Girl specials, but I’m looking forward to seeing Sunset as a villain. I do think that the first film likely won’t be the best one anyway, but I’ll go in with an open mind. Now I just want a true crossover adventure where the ponies and humans have to fight alongside each other. There’s definitely a lot of potential there. If you are a fan of the MLP franchise then you definitely need to watch it. If you like a good slice of life school adventure then this is also a good pick as it is a story that stands on its own pretty well without any real context. The magic stuff may seem out of the blue, but you’ll be able to roll with it since the story is still pretty straight forward.